I love making my own Christmas decor and I usually make these Dried Orange Slices at least once a year. They are perfect for garlands or hanging on the Christmas tree-you can even use them to make your own potpourri for your home or for gifting. (Or try this homemade potpourri!) 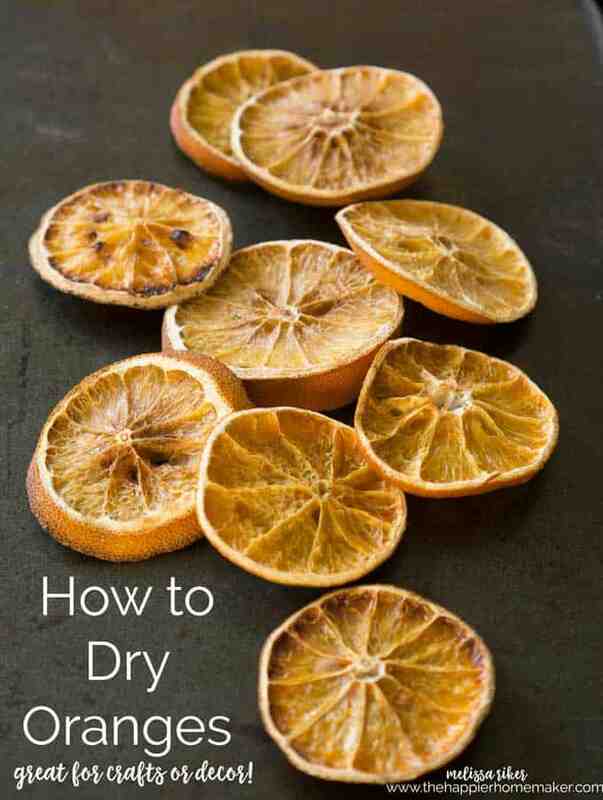 Here is how I dry orange slices, it’s so easy! Preheat your oven to 200 degrees Fahrenheit (93 Celcius). Prepare your pan with nonstick spray or a baking mat. This helps avoid a sticky mess when it’s time to remove the oranges from the pan. 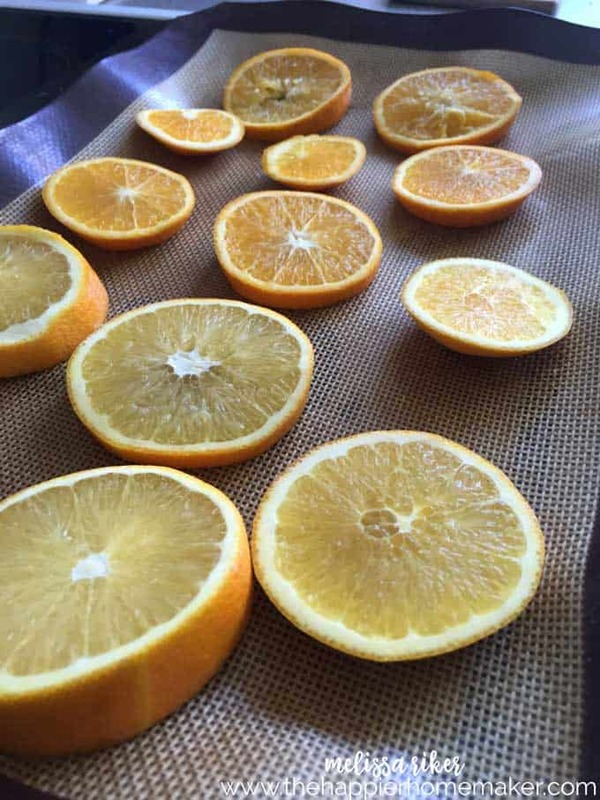 Slice oranges into 1/4″ slices or thinner. The thinner the slices, the faster they will dry. Place oranges in a single layer on the prepared pan, ensuring they do not touch. Bake for up to 6 hours or until completely dry. The key to a good result when drying fruit in the oven is using a very low temperature for a very long time. I dry my fruit over the course of 6 hours. Don’t attempt to raise the temperature to make it faster-you risk baking them instead of drying them! After the 6 hours remove the pan from the oven and allow to cool. Then you’re ready to use your oranges around your home! What would you use these dried oranges for? Let me know in the comments! Exactly the information I was looking for! Thank you! I will be using mine for in a mason jar candle. 😋 Thanks again! I plan on drying orange slices and apple slices for the birds to eat during the winter months in the midwest U.S. I will probably make a garland for them to enjoy. THANK you! I’m gifting stovetop potpourri for teachers at my kids’ school, and for family. I wanted to dry the oranges first so I can start making them now. I appreciate the instructions! We decorate our xmas tree with dried orange slices. Thanks for the info. Want to make orange Christmas wreaths for Christmas next year and give as gifts. I am planning on placing dried orange slices on the plate as decoration to accompany my dessert. This sounds easy…I hope it works. I am going to use 1/2 slices in my hot tea, to try and sweeten it naturally. I am planning to hang them in the Christmas tree. Our cats don’t like the smell of oranges. what about putting them in gin? Can this be done with clementines/cutie oranges oranges or just regular/navel oranges? Thanks for the easy instructions & tips! I’ll be using the oranges to make a garland for this Yuletide season! It will get me ready for the season & help me to remember the sunny warmth during these colder months. Thanks fir this. I’m presuming you are using degrees Fahrenheit and not Celsius. 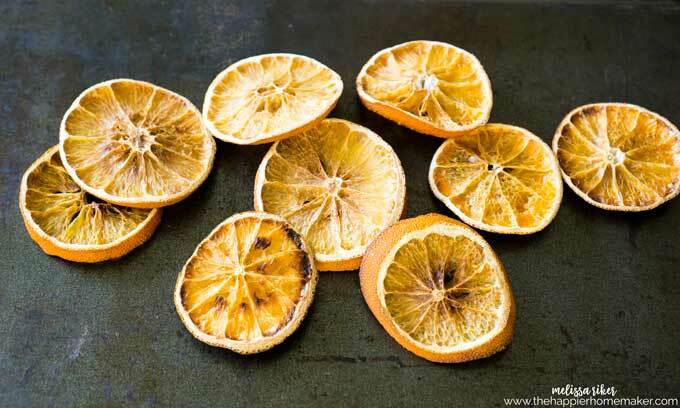 I’m going to dry orange slices fir hanging decorations next year. I’m using mine as a topper on citrus homemade soap!